I’ve often been asked why I don’t advertise WinPatrol and attract new PLUS customers using Google adwords or other online methods. Unfortunately, there’s competition for prime advertising space and since most folks use the free version of WinPatrol I just can’t compete. Here’s an example of other companies taking advantage of our good name in their own advertising. When they bid for keywords like WinPatrol I don’t stand a chance. Ironically, the following ads show up when I go to my LinkedIn profile. All the Google ads I’ve found seem to point to the same company although though they have multiple websites. I’m not familiar with the company that makes the RegCure program but it appears they use some heavy handed tactics to encourage users to pay for their software. There seems to be some debate online as to if RegCure is a “Rogue” application. When I searched for reviews on RegCure I found a number of websites that pretend to be review sites but just want to sell you RegCure or some other program owned by the same company. I can’t say they’re doing anything wrong other than annoy me but this kind of behavior sure is suspicious. 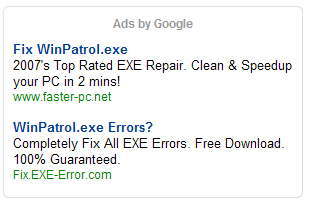 If you need to “Fix” WinPatrol just Email support and I’ll make sure you’re treated well and there won’t be a charge. Bill I think that some people miss the support@winpatrol.com email addy for some reason. The other thing is http://www.castlecops.com/forum105.html is a wonderful resource for questions regarding winpatrol I have found you reply within a few hours in regards to support email. That personal touch. I have found the moderators like Corrine and others have been great is helping with questions on the Castlecops forum. The final thing Winpatrol is so well crafted that I have very seldom have had to use either. Sad to hear about that company which I won't even name has caused such a headache. I like the fact that they have an Financial Post quote. Unfortunately, they cut out the part about "I was given a choice between stuffing a flaming porcupine in my pants, or RegCure... I prefer RegCure....."
Hopefully word of mouth continues to support Bill & others like him. I'm not a mental giant. I'm a run-of-the-mill computer user. I consider Bill Pytlovany a mental giant, a fine and decent man. I am a plus member and have recommended WinPatrol PLUS to lots and lots of people. Thank you Bill for the work you do.